Is there something more delicious than beautifully cooked eggs? It doesn’t matter how they are cooked, whether they are fried, boiled scrambled or poached, they are absolutely delicious. However, the most important thing for you is to eat eggs from healthy chicken. HOW TO RECOGNIZE A HEALTHY CHICKEN? So how can we say whether a chicken is healthy or not? A chicken which is in good health eat different sorts of foods every day. This includes meat because that’s the food they also need. They might want to eat different bugs, mice and even snakes. All the good nutrients from the food they have eaten are transmitted to their eggs. To gain these nutrients, the chicken needs to be allowed to move free, out on a fresh air. Chickens which are locked in small hatches for their entire life do not receive the vitamins and minerals they really need and their eggs are not on the same quality level as the eggs of the free-range chickens. Shell density and hardness: If the egg cracks easily than it is not a good-quality egg. Chickens which have a rich diet and a good overall health produce very strong eggs. If an egg is really healthy its shell should be very difficult to crack. 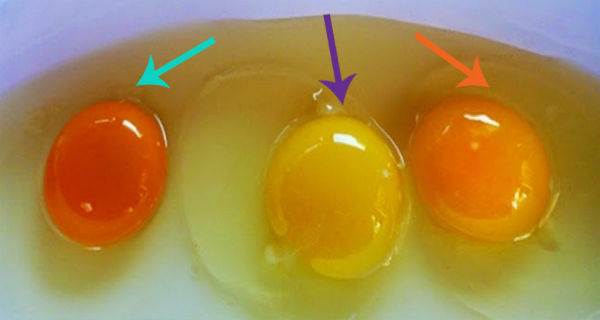 The color of the Yolk: For most people it is quite usual to see eggs with light or bright yellow yolks. However, this is not the perfect yolk color. The ideal color for the chicken yolks is deep orange. Next time you eat eggs check out the color of its yolk to make sure that you eat really good and healthy eggs. Thickness of the Yolk: The quality on the egg can be determined by the thickness of its yolk. The healthy egg yolks are usually thicker and rounder. Many researchers report that the healthy nutrition in chickens plays a great role in producing healthy eggs. A report in the Oxford Journal observes that the amount of beta carotene in eggs can be increased if the chickens consume more beta carotene. The Journal of Agricultural Food Chemistry states that the level of omega-3 fatty acids can be increased by increasing the DHA levels in chickens’ diet. WHERE CAN I FIND HEALTHY EGGS? Now when you know how a healthy chicken egg really looks like, you might be interested in the place where you can find them. Since there is a significant growth of the agricultural industry, you have plenty of choice for eggs. If you have enough space and desire, you can buy your own chickens and keep them in your garden. There they will have everything they need to produce the most delicious healthy eggs for you and your dear family. Contacting a local farm and asking for the way they raise their chickens is really not a bad idea. If their chickens are free and have access to different varieties of foods, then you can certainly give these eggs a try. You should definitely make an effort and try the eggs with orange yolk. We can guarantee that this effort will pay off as soon as you taste the difference!